02:34 — Karen Gillan: Preparing herself for Jumanji. 05:11 — Doctor Strange: Dan Harmon writing additional material. 07:19 — Dirk Gently: Coming to Netflix. 09:36 — Freema Agyeman: She-Hulk? 10:35 — Nuptials: Congratulations to Jo! and Wyn. 12:10 — Mythbusters: Build team making a series for Amazon. 13:59 – The Rocky Horror Picture Show (1975 film version). 29:10 – Convention: Whooverville 8. 40:24 – Doctor Who: The Horror of Fang Rock. 54:23 – Emails and listener feedback. 64:35 – Farewell for this podcast! 65:28 — End theme, disclaimer, copyright, etc. Wikipedia: The Rocky Horror Picture Show. Wikipedia: The Horror of Fang Rock. 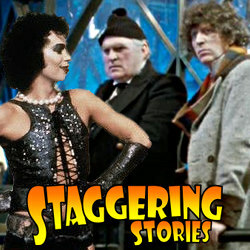 BBC: Doctor Who – The Horror of Fang Rock.